You may need to close your calzone like a pie with water to glue it together, and add a vent on top to keep the cheese inside. This is a guide about preventing cheese from leaking out of calzones. I love making homemade calzones, but the cheese always leaks out of them while baking. 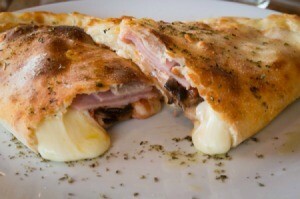 I pinch the edges tightly to make sure the calzone is sealed well, but the cheese still leaks out. Any suggestions? I manage a Pizza Shop. I have tried a few ways with calzones. The best is to almost double fold the edges, take both the top and the bottom part of the dough and roll it together and crimp it like you would a pie crust. Also it is very important to cut a few slits in the top to let out the steam. This should give you a beautiful Calzone. Ok, I'm not trying to be a smart alec, and this may not even be an option for you, but I would go to my local Italian retaurant that serves up calzones and ask them how they keep the cheese in. Many of these places are more than willing to help you out. That is how I discovered that the "secret" Mexican cheese dip that urban legend always said was goat cheese was nothing more than white Velveeta bought wholesale in Atlanta. Funny, but it worked. I've been making my own cheese dip now for many years! You might try adding a vent hole or two in the top of each one, in case it is steam buidup that causes the dough to open enough to make the cheese leak out. You might try wetting the edges with a water to seal before pinching them together, like a fried pie. The water acts as a glue with the flour. Hope this helps.